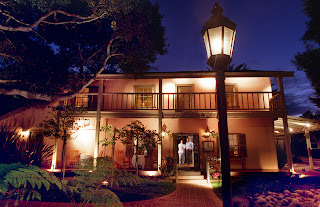 Last week, while on a business trip to Monterey, California, I had dinner one night at a restaurant called 1833. The menu featured some oddly intriguing items (my deep fried crispy hen egg over spinach appetizer was outstanding! ), but the restaurant’s main claim to fame seems to be that it is haunted. And sure enough, our server quickly launched into a well-rehearsed history of the building and its ghostly manifestations. The story revolved primarily around two previous occupants of the building - James Stokes and Hattie Gragg. 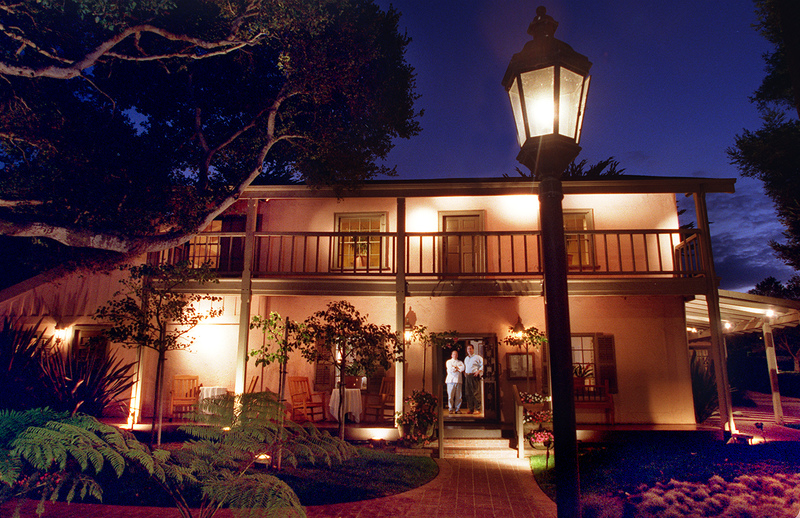 James Stokes bought the original small adobe structure on the site in 1833. He was a colorful shyster who passed himself off as a doctor when he jumped ship in Monterey in 1830 and parlayed his sudden popularity into, eventually, a turn as Mayor and an advantageous marriage to a widowed mother of four (our server maintained that the marriage only became possible because Stokes’ failures as a doctor led to the demise of the woman’s husband). Stokes may have been responsible for several other deaths, including one governor of the territory, either through his medical incompetence or more nefarious actions. Significantly for our story, he also committed suicide many years later, perhaps as the result of some scandal (one source suggests embarrassment over an incestuous relationship with a daughter, but who knows). The second player in our historical drama is one Harriett “Hattie” Gragg, who owned the building from 1890 to 1948 with her husband Mortimer (and really, shouldn’t any good ghost story feature a character named Mortimer?). Hattie and her husband were active socialites and their home was reported to be a constant center of parties and celebrity sightings (our server mentioned the Rat Pack and Marilyn Monroe, while one website suggested a more plausible John Steinbeck). After Hattie died in 1948, the house eventually became a restaurant called Gallatin’s, and has continued as a restaurant through a succession of owners and under a variety of names ever since. It was only after the building became Gallatin’s, that the ghostly sightings started occurring. According to many accounts, a man dressed in 1800s garb is sometimes seen climbing the stairs and/or passing through walls. This is presumed to be the ghost of James Stokes. Other accounts tell of a beautiful young woman in a party dress floating through the building. This is said to be the ghost of Hattie Gragg, who, the story goes, abides in the building, always seeking the next party. Other signs of the building’s haunted nature ranged from the traditional (lights coming on for no reasons, chairs being mysteriously moved, disembodied voices being heard) to the endearingly personal – Hattie was, according to our server, quite the prankster, and sometimes her ghost will surreptitiously put a pinch of salt into someone’s wine glass or tap a person on the shoulder to see their reaction when they turn to see…nobody. Our server wrapped up his tale with his own personal experience (I got the feeling having a personal encounter with the local ghosts was kind of a job requirement there). His was a somewhat confusing narrative about seeing ghostly apparitions moving in the restaurant’s windows in his car’s rearview mirror while talking on the phone late one night. OK. Sure. My immediate reaction to all of this, as it generally is in such situations, was to roll my eyes and ask things like “so, how did the ghost go from floating through walls to grabbing a pinch of salt? Wouldn’t her fingers go right through the salt?” But, since I didn’t want to immediately fall into the role of “that guy”, I instead asked for a show of hands as to who believed that the house, based on what we’d heard, was actually haunted. And, much to my surprise, almost every hand went up, some a little more tentatively than others. It turned out that, other than me, there were only one or two people at that table (of twelve) who didn’t believe that paranormal activities were real and probably accounted for at least some of the mysteries we’d heard about. There ensued a lengthy discussion, with several of my dining companions trying to convince me that there are just some things that can’t be explained (leading, of course, to the conclusion that such mysteries could only have paranormal causes). One woman told me in great detail of a specific experience she’d had involving a premonition that had, weeks later, turned out to correspond “exactly” with an event that had actually taken place far away from her and which she “couldn’t” have known about. While I tried to gently explain confirmation bias and to suggest just how lousy human beings are at remembering exact details, my protestations lost out to everyone else’s quiet acceptance of her supernatural experience. Other stories ensued, as pretty much everyone had either had some sort of paranormal experience, or knew somehow else who had. Pondering all of this later, I realized again how challenging it is out there for a skeptic. I mean, despite the fact that there were no paranormal sightings during our very delicious and expensive meal, somehow the event only served to confirm everyone’s preexisting beliefs about the paranormal. Obviously, the evidence for paranormal happenings at 1833 was scant, at best. There were scattered tales told and retold and embellished over the years, which happened to mesh nicely with the colorful histories of some of the building’s past occupants. The stories made nice marketing fodder for the current and previous owners, bringing the curious not only to gawk but also to dine. The Internet keeps the tales current, making it easy for believers to find and repeat the tales. In short, a whole lot of nothing becomes something that confirms and solidifies people’s goofy beliefs. How do I explain all the stories of ghostly happenings at 1833? With a shrug. Things go bump in the night, somebody hears a noise she can’t explain, there’s a trick of light or shadow spotted out of the corner of one’s eye…these become stories that get passed on and embellished and, before you know it, you have a haunted house. But the food was good and the company was quite enjoyable. And nobody – ghosts or otherwise – put any salt in my wine! Wow, we are going to visit the restaurant. I am going to order holly water for sure. As a kid who grew up nearby Gallatin's was well known as haunted. The poor Monterey Police got called so many times back in the 1960's when I first learned about it as a kid they finally stopped coming out as the cuffs would not fit the ghosts. The story I recall was someone was inside and set off the alarm. The MPD got in to hear the door upstairs slam shut. They chased it up there and on entering the room no one there an no way out of the room except by the cops. Can 1833 still do the Wild Siberian Bore for 300 with 24 hours notice? Going to Gallantin's, there's no gold rush Chinese food ether. Now ghost's are daily. Soledad is a hospice nurse,30 years. take a hospice nurse to lunch you'll be convinced. caution she doesn't want to be there when a lieyour or a cop dies, the room is filled with terror. I managed the restaurant when it was Stokes Restaurant prior to it being 1833. Yes, I can tell you I had experiences. We were actually a segment on California's Most Haunted Place (or something like that). I was interviewed for it. Another Meaningless (well, not to me) Milestone!